The Grand Prix Midget drivers from the Victorian club headed to Avalon Raceway for the first ever Wally Anskaitis Cup on Saturday night, and on a track being shared with a few classes on race night the big Super Sedans and their tyres created a slick race track with Travis Florrimell making the most of it and leading every lap in the feature event to pick up the big win from Shawn Ward and Chris Fowler. 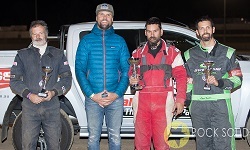 The first ever Wally Anskaitis Cup involved having Tyson Anskaitis there as a family representative to give the top three trophies out at the end of the night on the track to the podium drivers. The podium drivers them jumped onto a track ute and headed over to the back straight for a photo opportunity next to a part of history, the track concrete wall that had Wally’s name carved into it, which was a great moment for the podium drivers. The Avalon management themselves seemed delighted with the Grand Prix Midgets on race night with the owners of Avalon supporting the class for so very long and the class always making sure Avalon gets the dates they want each season, the racing on Saturday night further cemented that relationship and it was mentioned to the GP club that it was some of the closest, cleanest and fastest racing the class had delivered there in some time. Further adding to the nights testimonial was Sean Denning who ran his car paying tribute to Anskaitis by running Wally’s number 56 and original paint scheme on the wing of his car which was built by Wally. 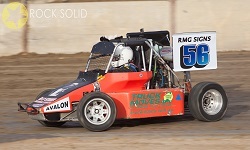 Two heats and a final was the format for the night and in heat one the line-up was Ward with Lisa Chalcraft, Florrimell, Troy Buis, Mark Blackeby, Sean Denning, Fowler and Jason Crawford (#50 – Pitstop Mowers – Yamaha) filling the grid. Ward got out to a terrific start leading lap one from Florrimell, Chalcraft, Blackeby and Buis and maintained that lead through to the end with victory confirmed over Florrimell, Chalcraft, Blackeby, Fowler and Buis whilst Crawford did not finish lap two when he rode over the rear wheel of Buis putting his car into the turn one concrete wall bending the chassis as well as the rear and front end, damage that is likely to see the car out on the sidelines possibly through the upcoming Australian title. Denning (#56 AR Fencing – Yamaha) spun and in the process he over threw the clutch and did not finish. For heat two the line up was Fowler, Denning, Blackeby, Buis, Florrimell, Chalcraft and Ward with Fowler from the prime pole position taking the lead through lap one with Florrimell, Denning, Blackeby and Ward (#44 Huntsmen Trailers – Yamaha) the top five. Blackeby moved into third on lap two getting past Denning and on lap three Ward moved past Denning also into fourth. 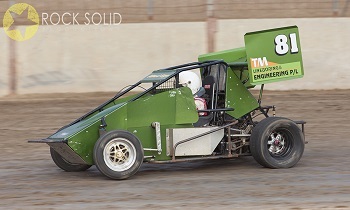 The eight laps went by with Fowler leading everyone to take the win from Florrimell, Blackeby, Ward, Denning, Chalcraft and Buis (#5 Rock Solid Productions – Yamaha). A twelve lap final for the Wally Ana Cup started with Florrimell, Ward, Fowler, Blackeby, Chalcraft (#15 Jacobson’s Transport – Suzuki), Buis and Denning the line-up with top qualifier to the front due to the race being a blue ribbon honary event honouring a legend of the club and class. Florrimell got around to the start finish line first to lead lap one from Ward, Fowler, Blackeby (#10 Spitfire Restaurant & Grill – Yamaha) and Chalcraft. Florrimell who for a few seasons now has shown how fast he can be at times avoided all the drama’s that have plagued his racing, much of them being chain related where the chain snaps that powers his engine. On this occasion no such problem arose and Florrimell (#81 TM Lineboring – Suzuki) went on to lead every lap and defeat Ward, Fowler, Blackeby, Chalcraft, Denning and Buis in the first ever Wally Anskaitis Cup. Travis mentioned after the event to some of the club members and the Avalon announcing and media team that it was an honour to win the Wally Anskaitis Cup and to be the first driver to do so is a memory he will cherish, nobody can take that away from him. He thanked Avalon and the GP club for their support and congratulated Ward and Fowler (#13 The Wow Factor – Yamaha) on completing the top three.